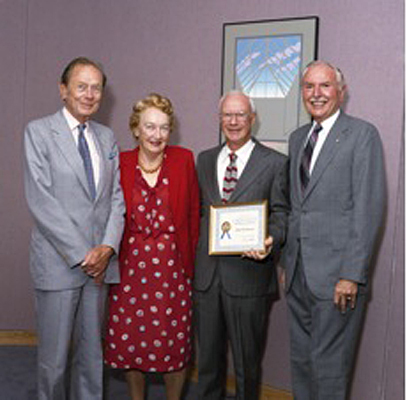 Left to right, J. Bruce Bredin, chairman of the Board of Trustees of the University of Delaware; Mrs. Marcene Dawson; Dr. John Minto Dawson, director of libraries at the University of Delaware; Dr. E. Arthur Trabant, president of the University of Delaware, on the occasion in 1986 of Dr. Dawson’s receiving a “Certificate of Appreciation” honoring his years of service. 3:31 p.m., Jan. 25, 2012--Dr. John Minto Dawson, 93, of Manassas, Va., and the former director of libraries at the University of Delaware, died on Dec. 6, 2010. The University of Delaware Library just recently became aware of his death. 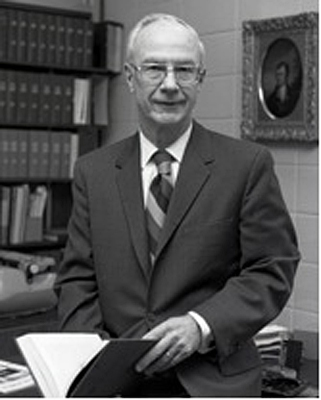 Dr. Dawson served as director of libraries of the University of Delaware from 1958 through 1979 and was widely respected by faculty and staff. After graduation from Tulane University and service in the U.S. Army, Dr. Dawson received a Ph.D. degree in librarianship from the University of Chicago. He wrote his dissertation on cataloging costs and recommended the complex implementation of cooperative cataloging among libraries. He later saw this brought to fruition in OCLC (Online Computer Library Center) of which he was an early supporter. Prior to his appointment at the University of Delaware, Dr. Dawson worked in the libraries of Tulane University, the University of Alabama and came to the University of Delaware from his position as assistant librarian (the number two position) at the University of Chicago. Dr. Dawson’s many accomplishments as director of libraries included the leadership in planning, design and construction of the original/initial structure of the Hugh M. Morris Library, which was completed and dedicated in 1963. (Subsequently, the Morris Library was doubled in size with the expanded building completed and dedicated in 1986.) Prior to 1963, the Library collection and services were located in Memorial Hall (then called Memorial Library). During the Dawson library administration, there was enormous growth in the Library collection with a major emphasis in transforming an undergraduate collection to become a research collection and which included the acquisition of the Unidel History of Chemistry Collection and the development of Special Collections. In 1974, the University of Delaware Library added its one millionth volume, Le Diverse et Artificiose Machine (Various and Ingenious Machines) by Agostino Ramelli (1531-ca. 1600), Paris, 1588, considered a landmark publication in the History of Science. Dr. Dawson worked with Nathaniel Puffer, assistant director for library collections 1964-92, who was also very instrumental in building and shaping a major research oriented Library collection. In 1957, along with Mrs. Caesar Grasselli of Wilmington, Del., Dr. Dawson was a leader in the establishment of the University of Delaware Library Associates, the “friends group” of the University of Delaware Library. He worked diligently with the founding members to ensure the early success of the organization, which is now in its 55th year. “In the spring of 1962, just as the library was occupying the very last free space in the Memorial building, site clearance and excavation began for the new library. President Perkins, knowing that the state legislature would provide no more than $3 million for the library project and recognizing that the building would hold many more volumes than the old library contained, had thought that the University could save money by building a small basement sufficient to accommodate only the building’s heating system. Dr. Dawson, however, kept arguing that a full basement would be necessary to house books sooner than anyone realized. The librarian got his way and 'Dawson’s Folly' was included in the contract.” The basement initially housed University Archives and soon also was filled with general library circulating collections, including Current Periodicals and Government Publications. In 1962, Dr. Dawson described the new Library in an article entitled “New Library Going Up!” in the alumni magazine, The University News, in which he stated prophetically: “We foresee the day when computers will be used in library research and when facsimile transmission will enable us to secure copies of books and articles from any major research library in the country almost instantaneously, and we have attempted to design for that day.” Dr. Dawson described the exterior design in brick relieved by concrete as “restrained contemporary” and, anticipating the disappointment of alumni traditionalists, explained that a Georgian design would have been inadaptable and more costly to build and maintain. The new library was named after Hugh M. Morris, who had served for 30 years on the University’s Board of Trustees, 20 of those years as its chairman. Dr. Dawson was very active in the American Library Association (ALA), serving for many years on the ALA Council, its governing body, and as a member of the ALA Executive Board. On Oct. 14, 1986, Dr. Dawson received a “Certificate of Appreciation” awarded to him by Mr. J. Bruce Bredin, chairman of the Board of Trustees of the University of Delaware, and Dr. E. Arthur Trabant, president of the University of Delaware. In his memory, the University of Delaware Library will add a special book to Special Collections in the field of Scottish literature, a beloved subject of Dr. Dawson.